The Cook, the Farmer, his Wife and their Neighbor: KKVB STORY - read here! This is the story of the project The Cook, the Farmer, his Wife and their Neighbor. Description step by step of the process that led to the realization of the community garden and the community kitchen and to the involvement of local residents. 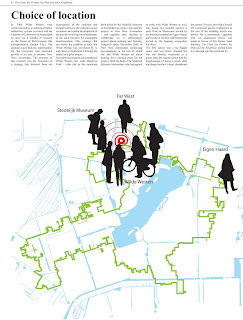 In 2008 Wilde Westen were commissioned by a coalition of public authorities, private investors and the Chamber of Commerce of Amsterdam to carry out 6 months of research on the theme of Bedrijventuin (the Entrepreneurial Garden City). 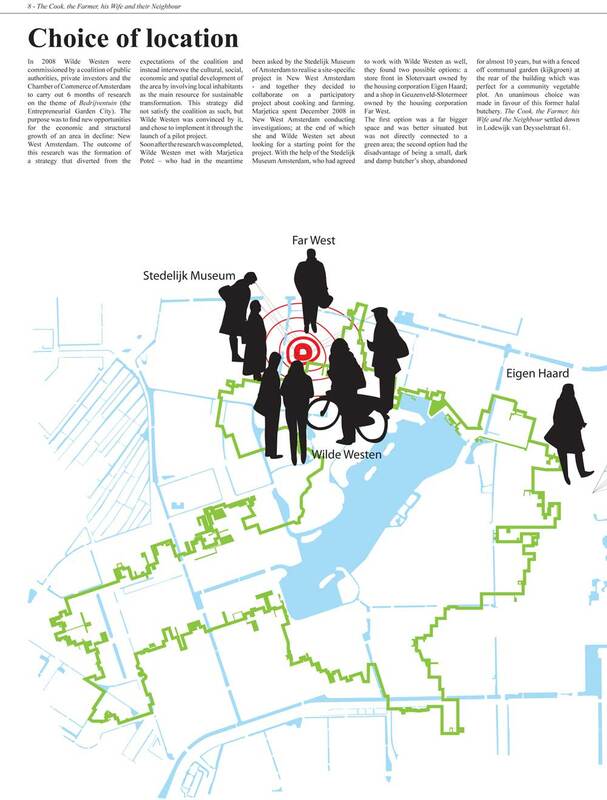 The purpose was to find new opportunities for the economic and structural growth of an area in decline: New West Amsterdam. The outcome of this research was the formation of a strategy that diverted from the expectations of the coalition and instead interwove the cultural, social, economic and spatial development of the area by involving local inhabitants as the main resource for sustainable transformation. This strategy did not satisfy the coalition as such, but Wilde Westen was convinced by it, and chose to implement it through the launch of a pilot project. 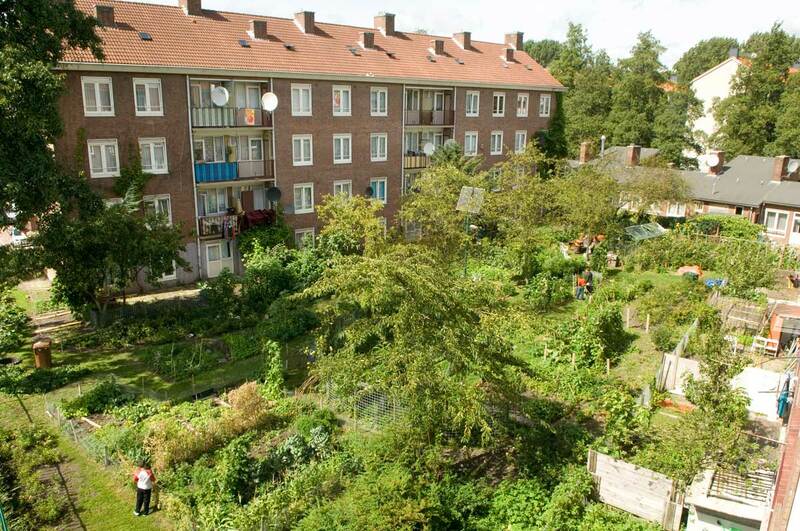 Soon after the research was completed, Wilde Westen met with Marjetica Potrč – who had in the meantime been asked by the Stedelijk Museum of Amsterdam to realise a site-specific project in New West Amsterdam - and together they decided to collaborate on a participatory project about cooking and farming. Marjetica spent December 2008 in New West Amsterdam conducting investigations; at the end of which she and Wilde Westen set about looking for a starting point for the project. With the help of the Stedelijk Museum Amsterdam, who had agreed to work with Wilde Westen as well, they found two possible options: a store front in Slotervaart owned by the housing corporation Eigen Haard; and a shop in Geuzenved and Slotermeer owned by the housing corporation Far West. 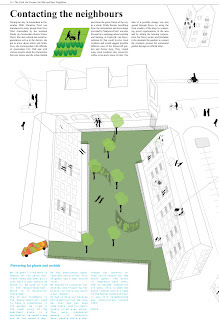 The first option was a far bigger space and was better situated but was not directly connected to a green area; the second option had the disadvantage of being a small, dark and damp butcher’s shop, abandoned for almost 10 years, but with a communal garden (kijk groen) at the rear of the building which was perfect for a community vegetable plot. A unanimous choice was made in favour of this former halal butchery. The Cook, the Farmer, his Wife and the Neighbour settled down in Lodewijk van Deysselstraat 61. The shop in Lodewijk van Deysslestraat consisted of a ground floor space of 30 m2. When we entered it for the first time the side and rear windows were boarded up, walls were rotten and covered with tiles, the hydraulic system was broken and the mezzanine was inaccessible. It needed a refurbishment from top to bottom. By contrast the garden behind was well maintained but felt very desolate. It was fenced off as a kijk-groen type. 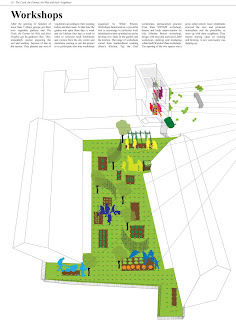 Although a communal garden for which local residents pay a monthly maintenance fee, it was closed to them; no one had the keys apart from the housing corporation and garden keeper, Rochdale. In New West Amsterdam there is a lot of vacant space and a big percentage of it is occupied by greenery, but this greenery is just space, it is not public, not available, not inhabited. This evident void - spread throughout the district and tangibly represented by a shop deliberately kept empty for 10 years and a deserted garden - inspired us to fill it with our dream of making space for the local community, of creating a place for everybody to use and to appropriate. 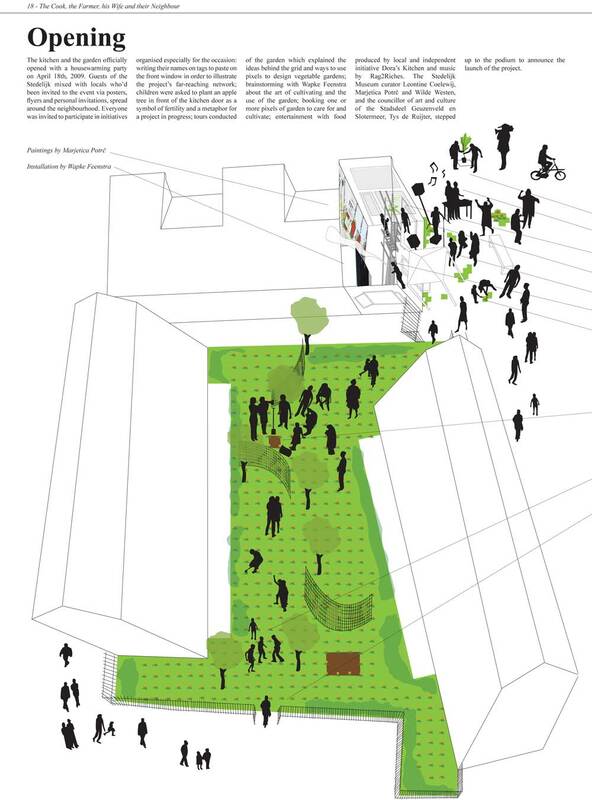 So we set about designing a collective cooking and farming hub together with local residents. During her stay in Amsterdam in December 2008, Marjetica Potrč was introduced to many people from Niew West Amsterdam by her assistant Dasha van Amsterdam (Koers Nieuw West). 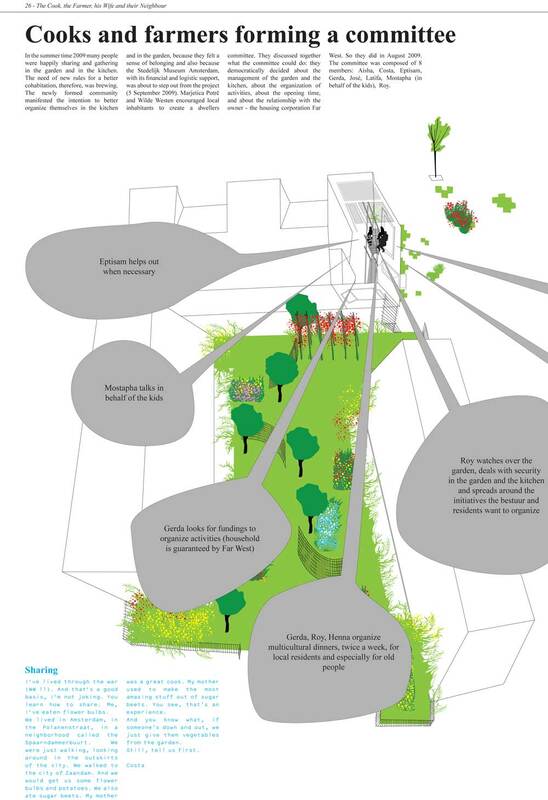 She met cultural and social organizations active in the district, she got to know about artists and initiatives, she corresponded with officials of Amsterdam City Hall and with various experts about the relationship between nature and the urban habitat and about the green future of the city as a whole. 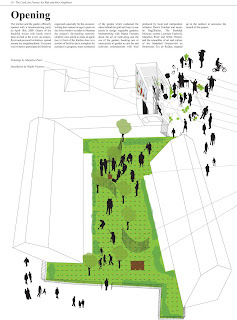 Wilde Westen, benefiting from the information and knowledge provided by Marjetica Potrč, was also focused on a campaign about cooking and farming in Lodewijk van Deysselstraat 61 that could involve local residents and would suggest possible different uses of the fenced-off garden and former shop. They visited many local residents; they stayed for coffee or tea and a piece of cake. 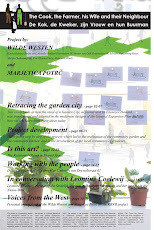 The idea of a possible change was also spread through flyers, by using the front window of the shop, by contacting social organizations in the area and by asking the housing corporations Far West (owner) and Rochdale (who maintain the garden) to contact the residents around the communal garden through an official letter. After the basic refurbishment was complete, Marjetica Potrč and Wilde Westen worked on the physical transformation of the former butchers by setting up a four-day workshop to turn the space into an efficient and comfortable kitchen. By assembling big wooden poles they created a cooking island with dishwasher, fridge, four camping cooking fires and a counter with two sinks. The dining island was composed of a long table, benches and a ladder giving access to the storage/mezzanine. The workshop also presented an opportunity to get in touch with the neighbours who came looking for information about the space and to help out. A second round of physical interventions took place right before the project opened; the soil in the garden needed sampling and this was executed by the artist Wapke Feenstra, invited to contribute to the project with research about the culture of farming. 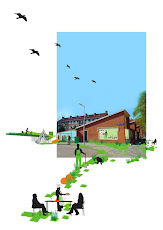 The Praktijkschool helped out by preparing the garden, and in accordance with our idea of dividing the plot into 1.5 x 1.5 pixels, planted Tagetes to design the grid. Grass tiles replaced some of the concrete tiles around the kitchen building, forming a small path which led up to the threshold of the garden. The front window of the kitchen got a makeover in the form of the new logo of the Cook, the Farmer, his Wife and their Neighbour covering the former sign of the butcher’s shop. Combining the old sign with the new logo spoke of the desire to preserve the history of the place, whilst reinventing a different use for it in the present time. The kitchen and the garden officially opened with a housewarming party on April 18th, 2009. Guests of the Stedelijk Museum Amsterdam mixed with locals who’d been invited to the event via posters, flyers and personal invitations, spread around the neighbourhood. 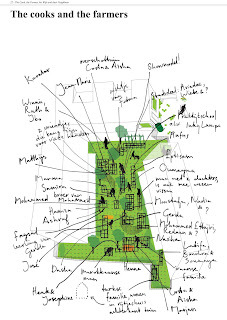 Everyone was invited to participate in initiatives organised especially for the occasion: writing their names on tags to paste on the front window in order to illustrate the project’s far-reaching network; children asked to plant an apple tree in front of the kitchen door as a symbol of fertility and a metaphor for a project in progress; tours conducted of the garden which explained the ideas behind the grid and ways to use pixels to design vegetable gardens; brainstorming with Wapke Feenstra about the art of cultivating and the use of the garden; booking one or more pixels of garden to care for and cultivate; entertainment with food produced by local and independent initiative Dora’s Kitchen and music by Rag2Riches. The Stedelijk Museum curator Leontine Coelewij, Marjetica Potrč and Wilde Westen, and the councillor of art and culture of the Stadsdeel Geuzenveld en Slotermeer, Tys de Ruijter, stepped up to the podium to announce the launch of the project. After the opening 22 families from more than 7 ethnic groups got their own vegetable gardens and The Cook, the Farmer his Wife and their Neighbour got its gardener: Roy. They immediately started preparing the soil and seeding as it was already late in the season. They planted all sorts of vegetables according to their cooking habits and tastes. 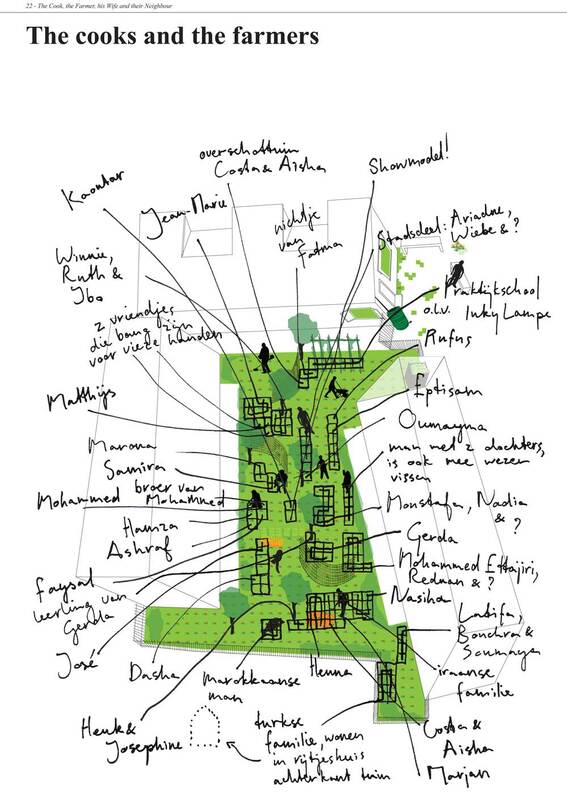 At that time the garden was open three days a week and the kitchen four days a week to local inhabitants and visitors from the city centre and elsewhere who had come to see the project or to participate in workshops organised by Wilde Westen. These workshops functioned as a powerful tool to encourage local inhabitants in particular to take the initiative and develop new ideas in the garden and the kitchen. The range of workshops varied from multicultural cooking (Dora’s Kitchen, Taji the Chef workshops), permaculture practice (Free State SWOMP workshop), theatre and improvisation for kids (Marina Breton workshop), designing with recycled material (LDSP workshop), to stalking and producing urban food (Wietske Maas workshop). 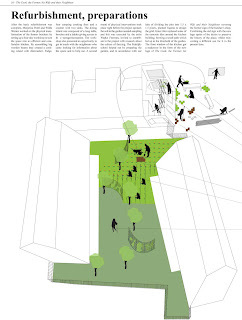 The opening of these two spaces had been a great achievement: local inhabitants enjoyed meeting up with their neighbours in a pleasant and protected environment. They started sharing ideas on cooking and farming; a new community had started to form. By the summer of 2009 many people were happily gathering and sharing in the garden and in the kitchen. 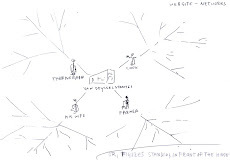 The need had arisen for a clearer and better organisation of this newly formed community partly to ensure it ran smoothly, but also because the Stedelijk Museum Amsterdam was due to withdraw its financial and logistic support (5 September 2009). Marjetica Potrč and Wilde Westen encouraged those participating local inhabitants to create a ‘dwellers committee’. 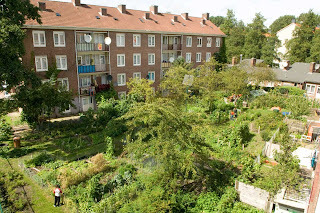 They discussed together what the committee could do: they made democratic decisions about the management of the garden and the kitchen, about the organisation of activities, about opening times, and about their relationship with the owner - the housing corporation Far West. So the committee was formed in August 2009 and was composed of 8 members: Aisha, Costa, Eptisam, Gerda, José, Latifa, Mostapha (on behalf of the kids) and Roy. In consultation with local inhabitants, the committee decided to organise a party to celebrate the harvest. Unlike the opening party in which the Stedelijk Museum Amsterdam had a great role, the harvest party was devised entirely by residents in collaboration with Marjetica Potrč and Wilde Westen. They applied to the Stadsdeel Geuzenveld en Slotermeer for funding and planned to set up a fair to showcase the products of the cultivated garden and the various outcomes of the garden and kitchen initiatives. 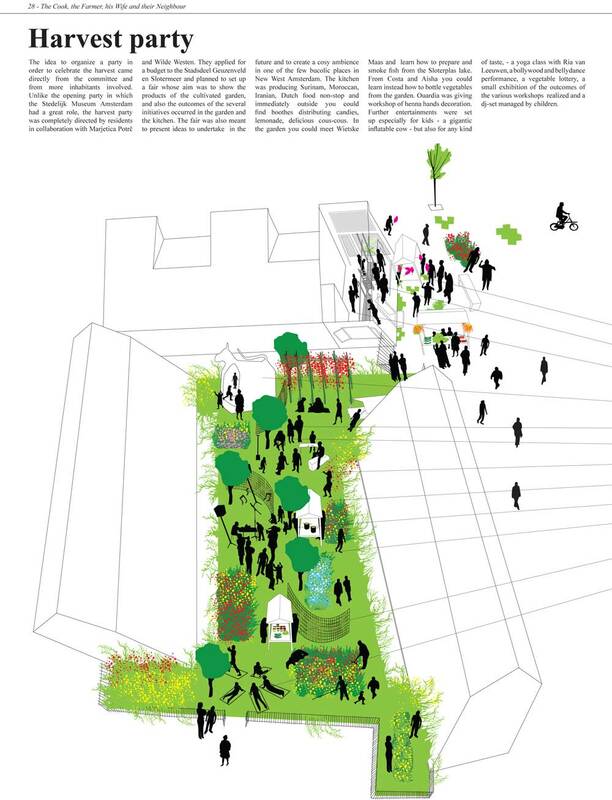 The fair was also meant to propose possible future initiatives, and to create a cosy ambience in one of the few bucolic places in New West Amsterdam. During the fair, the kitchen produced Surinam, Moroccan, Iranian and Dutch food round the clock and immediately outside you could find booths distributing candies, lemonade and delicious cous-cous. In the garden you could meet Wietske Maas and learn how to prepare and smoke fish from the Sloterplas lake. Costa and Aisha gave lessons on preserving vegetables from the garden. Ouardia presented a workshop on henna hand tattooing. Further entertainment was provided especially for kids in the form of a gigantic inflatable cow - but also for all tastes, a yoga class with Ria van Leeuwen, a Bollywood and belly-dancing performance, a vegetable lottery, a small exhibition of the outcomes of the various workshops realised and a DJ set managed by children. The Cook, the Farmer, his Wife and their Neighbour has developed and grown out of the enthusiastic participation and active contribution of more than 100 people who embraced farming and cooking as a way of sharing knowledge and tradition at a time when demolition and redevelopment are causing many to feel uprooted. It proved beyond a doubt that inhabitants care about their neighbourhood and that by appropriating these two spaces they have developed a sense of belonging to this part of the district. This has also brought security to Lodewijk van Deysselstraat and added real value to the neighbourhood. The project no longer needs our mediation; it can now live and progress by itself. 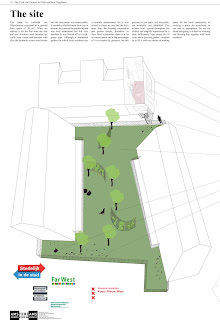 We will be more effective in the neighbourhood if we are able to operate on a larger scale; we have to move on, and to strengthen the character of the place by extending our vision of re-appropriation to the entire street of Lodewijk van Deysselstraat and to the neighborhood Geuzenveld en Slotermeer beyond. To ensure the sustainable redevelopment of the area, the active participation of its inhabitants is not only important but also fundamental. taken by Rufus de Vries in October 2010.